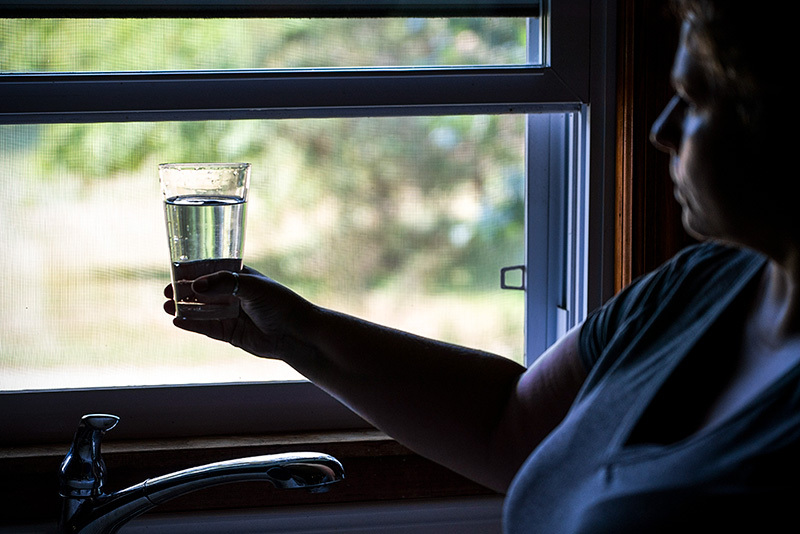 New tests reveal that coal ash is contaminating groundwater across America. Now, regulators want to weaken monitoring and cleanup requirements. Barb Deardorff and other residents of Wheatfield, Ind., are concerned about coal ash contamination from a nearby power plant. 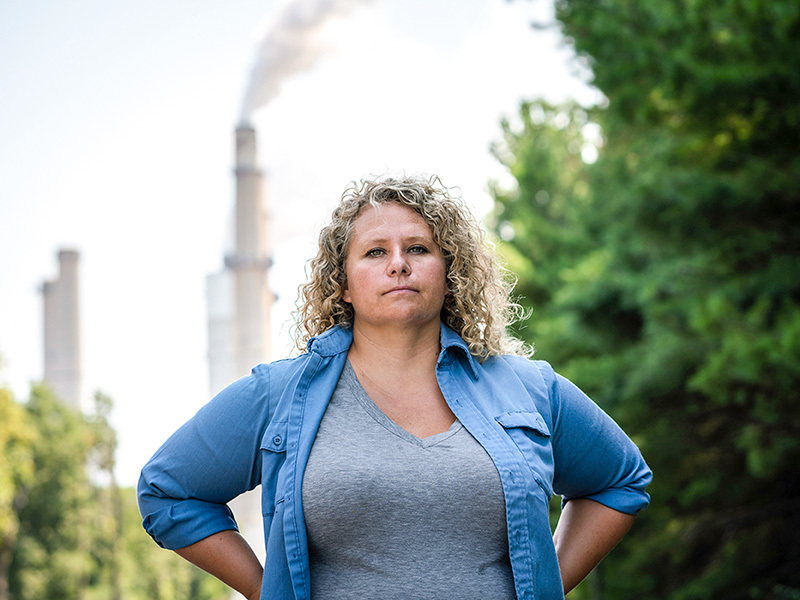 For as long as she can remember — and even before then — the silver-colored smokestacks of the Schahfer coal plant in Wheatfield, Indiana, have cast a shadow over Barb Deardorff’s life. In the 1960s, Deardorff’s grandfather and his family were forced to relocate after a corporation decided to build a coal plant on the family’s property. During her childhood, Deardorff’s school bus drove past the site and the pile of ash the plant created from burning coal. She remembers watching the huge pile grow a little each day. Learn about the coal ash problem. Today her own house, which has been in the family for generations, sits about a mile from the coal ash site. Deardorff’s proximity to the plant means she’s well-attuned to its operations. She sees when the bleach white smoke trailing from the stacks occasionally turns a murky yellow, and she hears the steamy roar that permeates her home whenever the plant shuts down a turbine. But these are minor nuisances, she says. To her knowledge, the plant rarely caused major issues. That all changed one spring morning in April. With The Times of Northwest Indiana newspaper in one hand and a cup of tea in the other, her eyes widened as she read about how the plant’s coal ash pond was contaminating the nearby groundwater. The news shocked and scared Deardorff. 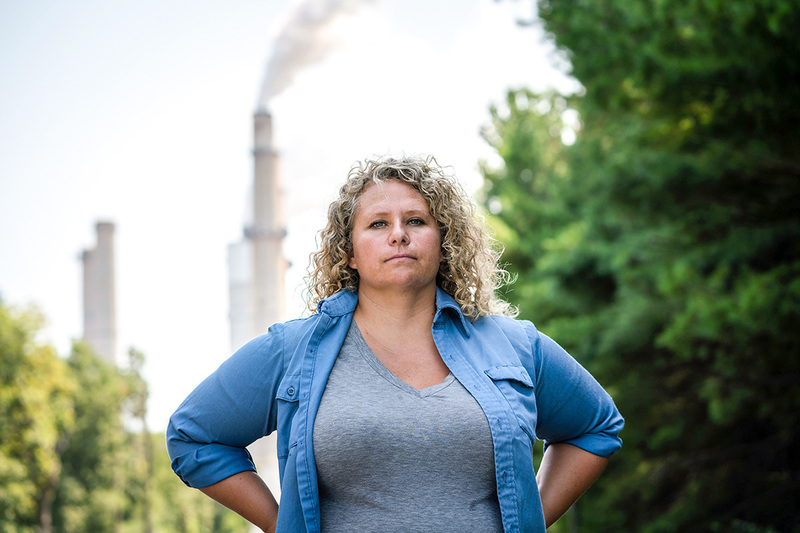 As someone with a background in environmental science, she was all too aware that coal ash is filled with poisonous chemicals. Then came anger: Why was this information coming from the local newspaper, rather than the state environmental department or the coal plant itself? “No one told us,” she says. Newly required water testing is uncovering just how extensive the coal ash contamination problem is. The coal plant operator came to know about the contamination only reluctantly. New rules enacted in 2015 require, among other things, that electric utilities nationwide test the water near their coal ash dumps to make sure they’re not leaking toxic contaminants. Though utilities have to share the information publicly, the new regulation doesn’t specify a central location or particular format for the data, making it difficult for the average person to find or make sense of the data. As teams of lawyers and scientists pore through the hundreds of thousands of pages of incoming reports posted by hundreds of power plants, the picture that’s emerging is grim. This map shows coal ash sites covered under the 2015 coal ash rule. 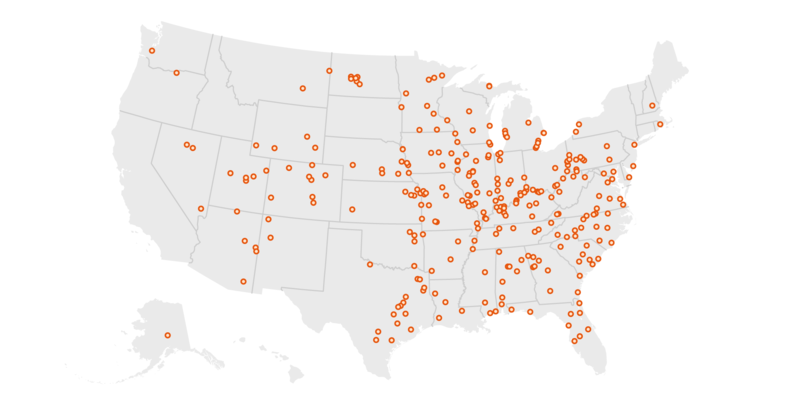 In total, there are more than 1,400 coal ash sites across the U.S. In Indiana, coal ash ponds are leaking at 15 out of 15 power plant sites tested. But the problem isn’t limited to the Hoosier State, which currently has the most coal ash dumps in the country. Based on the industry’s own data, 92 percent of all coal ash ponds and landfills tested under the new rule have contaminated groundwater with harmful levels of toxic chemicals like arsenic and boron. Oklahoma reported in June that 4 out of 4 sites tested had contaminated groundwater, while Illinois revealed in November that 22 out of 24 coal ash sites tested positive for groundwater contamination. 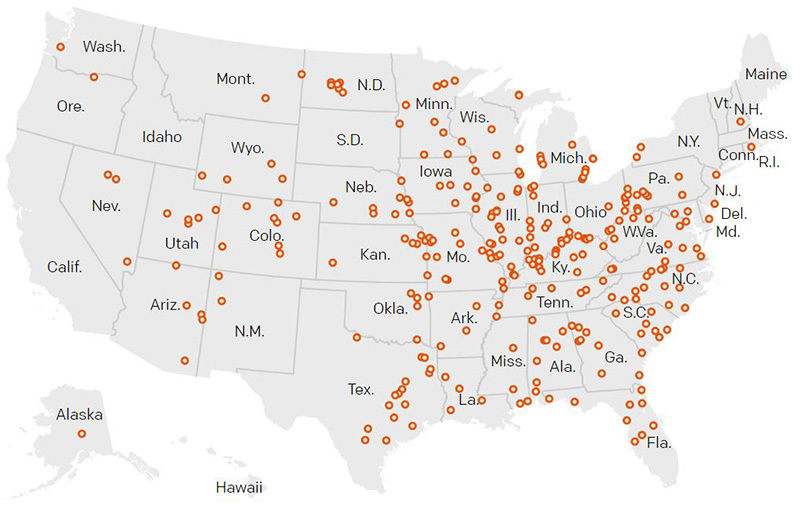 In total, the U.S. is home to more than 1,400 of these sites, many of them filled with millions of gallons of toxic ash. Last March, Trump’s EPA heeded their wishes, proposing to gut coal ash regulations just as the nation began discovering that many coal ash ponds and landfills are leaking toxic pollutants into groundwater. The 2015 rule opened a door to a hidden disaster; weak regulators now want to slam it shut. And they’re just getting started. Hundreds of coal power plants burn over a billion tons of coal every year. Coal ash, the byproduct, is filled with toxic levels of multiple pollutants — which can poison drinking water sources. Coal is filthy, as anyone who’s ever lived near a coal plant or snagged a few nuggets off of an idling train will tell you. So it’s no surprise that its byproduct, coal ash, is also full of toxic chemicals. 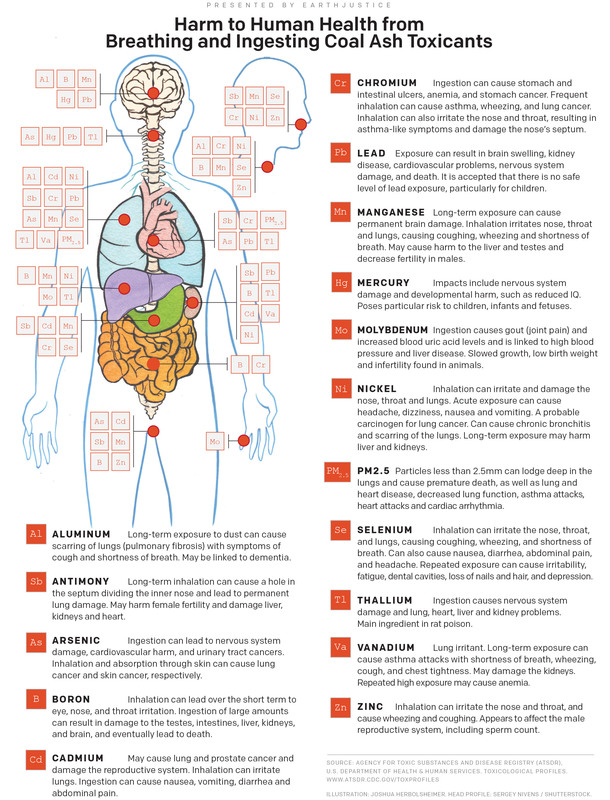 Arsenic, mercury, lead, and chromium top the list — and exposure to all of them can cause serious health impacts like kidney disease and many types of cancer. Despite being one of America’s largest industrial waste streams, coal ash has long enjoyed looser regulations than those applied to household garbage. That all changed in 2015. After decades of advocacy by Earthjustice and our allies, the EPA enacted its first-ever regulations for coal ash. The agency’s decision was prompted in part by the public outcry following a catastrophic spill in Kingston, Tenn. In 2008, more than a billion gallons of coal ash burst through a dam and destroyed the community. Over the course of eight public hearings in 2010, environmental and public health groups, community organizations, Native American tribes, and others submitted more than 450,000 public comments on the EPA’s proposed regulation, with many of them calling for the strongest protections under the law. The Kingston Fossil Plant coal ash spill was the biggest toxic waste spill in U.S. history. It claimed the lives of more than 30 people, both during and after the spill, and over 250 are still sick. One of those groups was the Hoosier Environmental Council (HEC), an environmental nonprofit in Indiana. For decades, HEC had tried to get the state to rein in coal ash, but the electric utilities and coal companies proved too powerful. Prior to the new federal regulation, Indiana had some of the worst coal ash rules in the nation. Professional engineers weren’t required to design the ponds, and the ponds themselves didn’t have to be inspected or monitored. As a result, almost all of the state’s 86 ponds are unlined and located next to a water source. All but three coal plants have dump sites located in the 100-year floodplain. “Indiana is a prime example of what happens when states regulate their own ash,” says Maloney. Despite Indiana’s dismal track record, it’s among a handful of states set to regain oversight of coal ash, thanks to a 2016 amendment that allows the EPA to approve state-based coal ash permit programs that will operate in lieu of the federal coal ash rule. “History tells us that state regulators are vulnerable to political influence from dominant industries, and that polluting industries will put their profits above public health and safety if they are given the opportunity,” says Earthjustice attorney Lisa Evans, an expert in hazardous waste law. 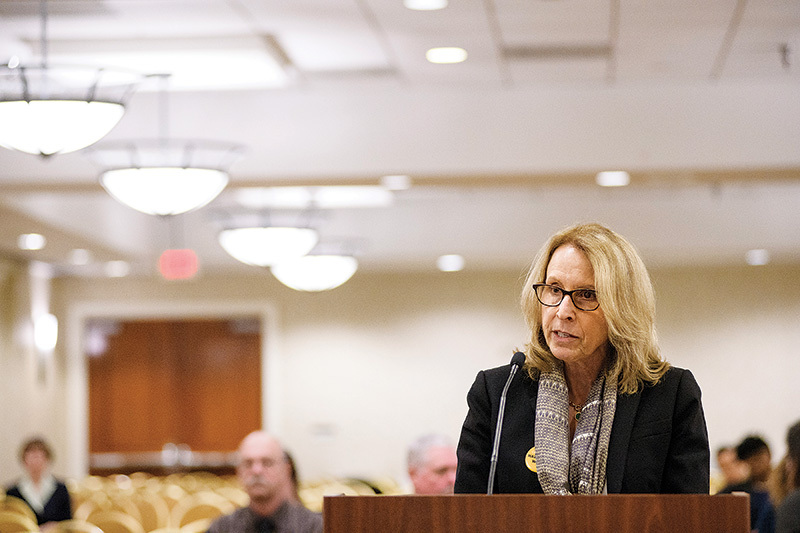 Earthjustice attorney Lisa Evans urged the EPA to maintain restrictions on coal ash disposal at a public hearing in March. In fact, the utility that owns the coal plant in Wheatfield has already announced that it’s dropping its plans to install a safer wastewater treatment system at one of its plants. The utility cited as its reason another of the Trump EPA’s rollbacks on coal ash, which focuses on wastewater restrictions. Earthjustice, alongside clients like HEC, Waterkeeper Alliance, the Sierra Club, and the Environmental Integrity Project, is challenging these regulatory rollbacks in court, while at the same time pushing to strengthen the original 2015 rule. In August, an appeals court agreed with the advocates that the rule needs to be strengthened, rather than weakened, which bodes well for those fighting against Trump’s efforts to gut the new rules. But while the issue plays out in court, people like Deardorff are left to deal with the mess that the recent tests have revealed. After Deardorff learned that coal ash had contaminated groundwater near her home, she called the Hoosier Environmental Council, which had alerted the press to the news, and they referred her to the county and state health departments. Eventually, she was put in touch with someone who told her the state would do some well testing in the area. Her house, however, wouldn’t be in the first round. Barb Deardorff worries that coal ash is contaminating her drinking water. “Being within one mile from the coal ash site and half a mile from their property line, I was surprised I wasn’t in that initial set,” says Deardorff. She suspects that if she hadn’t pressed the matter, she might not be on the well testing list at all. She then began calling her friends and family nearby to warn them about the contamination. Though Deardorff herself doesn’t suffer from any major illnesses, she says that several of her neighbors have gotten sick or been diagnosed with various types of cancer over the years. 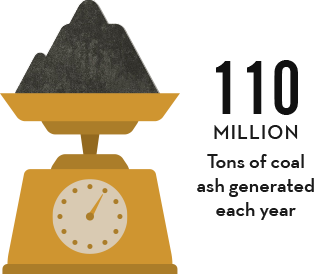 Many of the components of coal ash are harmful to human health. Deardorff’s dogged pursuit to make things right stems from early childhood. She remembers reading Dr. Seuss’ The Sneetches, where bright yellow creatures with stars on their bellies decide they’re better than the same creatures without stars. It was her favorite story, but it also used to get her so upset. But fixing coal ash contamination isn’t easy, particularly if the tests reveal the contamination has seeped into drinking water. Nearly two decades ago, another community in Indiana faced a similar situation. In the early 2000s, residents of the Town of Pines, Indiana, discovered that a nearby coal ash landfill had contaminated their groundwater with arsenic and other dangerous contaminants. Though about half the homes were eventually given bottled water or hooked up to the neighboring city’s water lines, ongoing contamination persists to this day. The town is currently listed as a Superfund site. The coal plant that dumped the ash is owned by the Northern Indiana Public Service Company (NIPSCO) — the same company that owns the Schahfer plant in Wheatfield. Similarly, NIPSCO did not warn the Town of Pines that disposal of its coal ash was poisoning the water when the company first discovered the contamination. It’s no small task to take on a powerful company with seemingly unlimited resources, especially in a town like Wheatfield, which suffers from the same sense of diminished community as many small towns across America. As working class families log longer hours to make ends meet and traditional gathering places like the local coffee shop are shuttered, people don’t have time to talk to one another — much less organize — like they used to. “People are busy going about their lives, so until something becomes an emergency, it doesn’t rise to the surface,” says Deardorff, who herself works a full-time job as an organizer for the local teachers’ union. Still, she’s determined to keep on pushing until she’s satisfied that her well water — and the water of her nearby friends and family — is safe to drink. A version of this story was originally published in the Earthjustice Quarterly Magazine, Fall 2018 issue. Be the first to read stories like this one and support our work fighting to transform our country’s energy sector into one that is clean, renewable, and modern, with a tax-deductible investment in Earthjustice. Lisa Evans is a Senior Administrative Counsel with 20+ years expertise in hazardous waste law. Through hard-hitting litigation and administrative advocacy, Earthjustice’s Coal Program is working to end our nation's reliance on dirty, expensive, and outdated coal-fired power plants, and to achieve a just transition to a clean energy economy.